Another coupla months, another coupla conventions, and another dozen or so furries in the world media! How fun! Furries appear on American Dad! Furries, therians and all manner of human-animals. The furriest flick you’ve never heard of. Disney’s Bollywood arm brings us a smart-talking dog. The New York Times snaps up some fur in a segment on obsessions… quite. (See above) A light-hearted jab at furries; apparently Mr Squirrely isn’t good enough for Patrick Stuart. 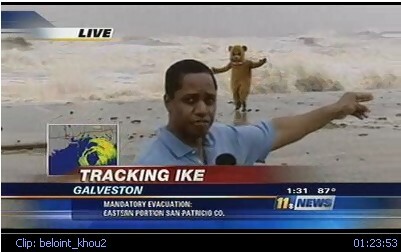 A lone fursuiter braves Hurricane Ike. So much for the Canadians being nice! We ain't afraid of no hurricane! "trying to bridge human and dragon understanding"
TMF on fursuiting… in Dutch… good. Hammy draws in the furry vote for Obama. (See below) Over the Hedge’s Hammy helps Obama gain the furry vote. As seen in Thueringer Allgemeine, and Rennsteig.TV!